...Sectors, but also from the IT and Industrial sector. It can also be said, that two stocks are currently components of the Dow Jones Industrial Average-Index. A CAGR of 15% since the year 1991 looks like a nice return. From Jan. 1991 until April 2018 this compound annual return figure led to a final outcome of + 4,580%. 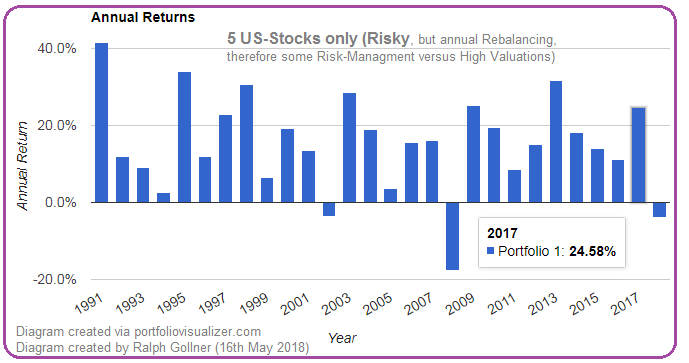 There were three negative years since 1991, the worst being (of course) the financial-crisis year 2008, where the portfolio produced a loss of minus 17.68%.